The rate of motorcycle tax evasion is barely a third of the figure we were told last year, according to a report from the Department for Transport. 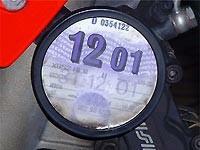 The new research says an estimated 2.3% of motorcycles seen in traffic are untaxed, compared to 6.5% last year. The estimate for the total rate of untaxed bikes is also down sharply, from 9.8% last year to 3.6%. Researchers believe untaxed bikes cover less miles and so boost the rate seen at the roadside to arrive at the total rate. Last year’s figures themselves were a dramatic fall over the previous year’s, which said 38% of bikes were untaxed. The discrepancy caused huge embarrassment to the DfT, which was forced to admit its earlier figures “may have been erroneously inflated”. Edward Leigh MP, Chairman of the Commons Public Accounts Committee, issued an apology after relying on DfT figures to make widely reported claims that ‘nearly 40%’ of motorcycles were untaxed and ‘large parts of the biking community are cocking a snook at the law’. Despite the retraction motorcyclists are still lumbered with accusations of tax dodging by the misinformed. The Association of Chief Police Officers (ACPO) recently told the Commons Transport Committee motorcyclists were guilty of tax evasion ‘on a massive scale’. The association has since admitted this was wrong following pressure from MCN.